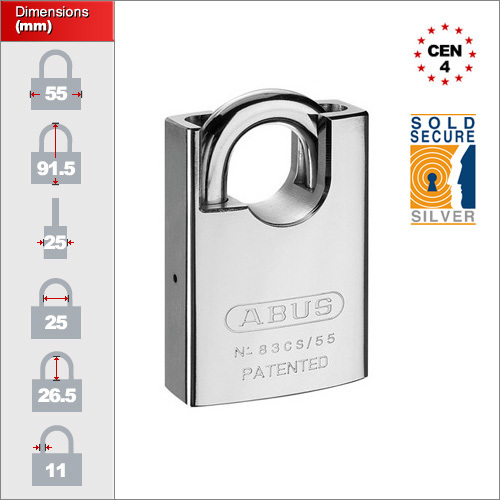 These ABUS Rock padlocks have been in the market for a while and very reliable. They are made up in Germany and so the quality control is as good as it can be. This is the closed shackle variety which means it has additional protection from bolt cutters and crow bars. Click the image above to see the full dimenions to ensure it fits your application. The body is solid hardened steel and the shackle is also 11mm hardened steel making it very difficult to cut or bolt crop. The steel grade is also very high which can be a problem in cheaper locks. Unless hardened steel is stringently controlled it can end up either too soft or too brittle. A fine line between the two needs to be met. The lock is BSEN 12320 / CEN rated to grade 4. If you''re unfamilair with this system this please read this page first: https://www.padlocks.co.uk/advice/insurance-cen/. It is also one of very few locks to be Sold Secure rated to Silver. Note: This review is for the 34 series of steel padlocks which are identical apart from the locking cylinder which uses a different type of key way. We will endeavour to bring you a review of these 'Rock' padlocks ASAP! All our padlocks are delivered with 2 keys each inclusive of the price. If you require more then please see our Additional Keys section. There is only one size of this model but we do small versions in the Extreme Range and also large types in the Granit Range. Click on the image above to show the full lock dimensions. 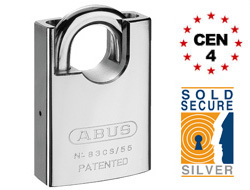 As a CEN4 lock it is regarded as "high security" and should satisfy the needs of most insurance company. Since this lock is closed shackle you must ensure it will fit your application. The closed shackles will restricted movement.